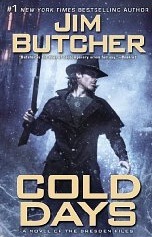 I am addicted to Jim Butcher's tales of Harry Dresden, Chicago's wizard PI. With the film noir touches, the old VW bug and a Fu dog of his very own, how could I not love Harry Dresden? Cold Days is the latest installment in Butcher's series about the politics and antics of the magical realm and how they cross over into ours. The entire quirky cast is back and Harry isn't even dead! I'll hold off on other spoilers and suffice to say I loved it.